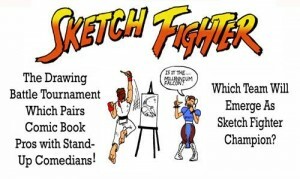 On January 24th, Comics and Comics will bring Sketch Fighter back to THE COMIC BUG. Guest artists include ANDREW ROBINSON (The Fifth Beatle), LIVIO RAMONDELLI (Transformers) RAFAEL NAVARRO, SCOTT LOBDELL, and RALPH MIRANDA. All of the artists will create a drawing prior to the game and these drawings along with all art made during the game will be auctioned off and given to the HERO INITIATIVE. Following the game and the auction, the Comics and Comics stand-up show will take place, featuring the best all fanboy stand-up comedy in the Multiverse from JOE STARR, RON SWALLOW, ED GREER, TIM POWERS, SCOTT LOBDELL and TOM FRANCK.